Successfully Added Siswoo A4+ Android 5.1 Smartphone - 4.5 Inch Display, Dual SIM 4G, Quad Core CPU, 1800mAh Battery, Smart Wake, 1GB RAM to your Shopping Cart. 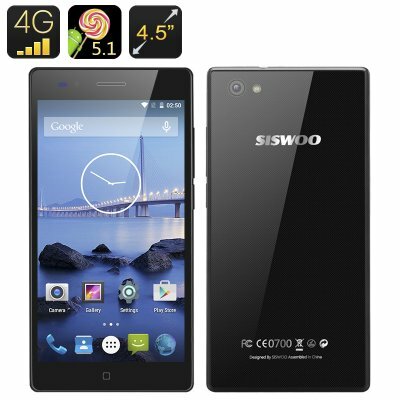 Part of Siswoo’s entry level line the Chocolate A4+ is a 4G Smartphone for those on a budget. Despite its appealing price the A4+ offers a good finish as the shinny mirror glass back makes it aesthetically pleasing and feel nice to hold. With a 4.5 inch display the phone is fairly small so it’s easy to use with just one hand, the smart wake functions enhance the experience and make this really enjoyable to use, just draw a character on the screen with and your taken to the desired app, what’s more you can even customize these options so you can set up the apps you use most. Running on a 64Bit Quad Core CPU with 1GB of DDR3 RAM the phone is more than capable of everyday use and can happily handle multitasking as well as offering some gaming fun. This SOC from Mediatek offers 4G FDD-LTE network support and dual SIM standby so you can keep connected with two numbers on this one device. Android 5.1 comes as standard and along with tweaks to the quick settings it has a revamp version of the screen pinning which allows you to lock guests or kids into a particular app meaning if they borrow your phone to play angry birds they can end up accidently deleting your contacts or meeting reminders. Along with all these features you also get front and rear cameras, 1800mAh battery that should give you up to 6 hours of constant use and a micro SD card slot that lets you add an additional 32GB of memory. At under $100 it’s easy to see why this phone is such a good option. This Siswoo A4+ Mobile Phone comes with 12 months warranty. Brought to you by the leader in electronic devices as well as wholesale Android Smartphones, Chinavasion..